IKEA as a brand comprises two separate owners. INGKA Holding B.V. owns IKEA Group, the holding of the group. At the same time that is held by the Stichting INGKA Foundation, which is the owner of the whole Group. IKEA Group is not the owner of the brand, which is managed by Inter IKEA Systems B.V., part of Inter IKEA B.V. that is the real owner of the IKEA Concept. Thus, IKEA Group is a franchisee that pays 3% of royalties to Inter IKEA Systems. This organization might sound a bit confusing at first, but I looked into it to see how its business model work. The IKEA organization is peculiar. While many believe that IKEA as a concept and IKEA as a store are owned, operated and run by the same people. In reality, the organization of this company is way more complicated. At this stage, it is critical to making a distinction between two entities: IKEA Group run by INGKA Holding B.V. and the IKEA worldwide franchisor, run by Inter IKEA Systems B.V. While the IKEA Group takes care of the centers, retails, customer fulfillment, and all the other services related to IKEA products. Inter IKEA Systems B.V., which is the owner of the IKEA Concept, and the worldwide franchisor of IKEA stores take care of the processes, distribution of products, training of its staff and other related activities in line with the franchising agreements. IKEA Group, who runs IKEA stores is the franchisees and owned by a holding called INGKA Holding B.V., which in turn is owned by the foundation Stichting INGKA. Inter IKEA Systems, owner of the IKEA Concept, which is the worldwide franchisor and owned by Inter IKEA Holding B.V.
Let’s dive more into IKEA unusual ownership structure. The INGKA Holding B.V. is the holding of the group. At the same time, this is owned by the Stichting INGKA Foundation, which is the owner of IKEA Group. As a foundation, the profits generated from IKEA activities can be used in two ways: either reinvested in the IKEA Group or they can be donated for charitable purposes through the foundation. IKEA range and supply (IKEA of Sweden AB and IKEA Supply AG), takes care of 9,500 products in the IKEA range, 24 purchasing offices, 1,000 home furnishing suppliers in 51 countries as of 2017.
franchising (Inter IKEA Systems B.V.) counts 11 separate franchise agreements via Inter IKEA Systems B.V. While IKEA Group is owned by INGKA Holding B.V., which is owned by the Stichting INGKA Foundation. Inter IKEA Group is owned by Interogo Foundation, based in Liechtenstein and established in 1989. Its main purpose is “to own and govern Inter IKEA Group and to invest in Inter IKEA and thereby in the further expansion of the IKEA Concept, in order to secure the independence and the longevity of the Group and the IKEA Concept” tells us its official page. 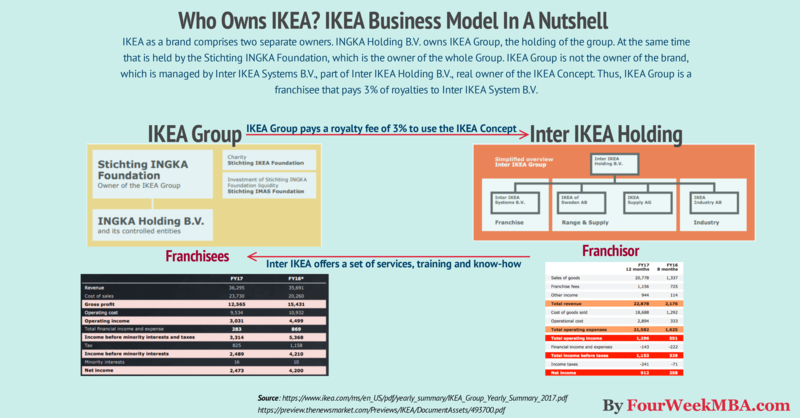 What is the IKEA Group business model? The IKEA Group business model is a franchisee that pays a 3% fee to Inter IKEA Systems B.V. that acts as a franchisor. As of September 2017, the company recorded over €36 billion in revenues, €3 billion in operating income and almost €2.5 billion in net income. At geographical level Europe, with Germany brings in 15% of the revenues, while US 14%. The revenue growth since 2008 has been quite fast. The IKEA Group went from €21.5 billion in 2008 to €36.3 billion in 2017, an almost 70% increase. What is the Inter IKEA Systems business model? Inter IKEA Systems B.V. follows a franchising business model. In fact, the stores are operated via franchising agreements that will pay a 3% franchise fee. On the other hand, the franchisees (the stores paying the fee to Inter IKEA Systems) have in exchange the right to operate the stores under the IKEA concept and IKEA brand. Thus, they gain access to systems, methods, and procedures that go from staff training, manuals, store layouts, display concepts and so on. Total revenues in 2017 amounted to €23 billion. IKEA franchise agreements with INGKA (owner of the IKEA Group) and oher 10 franchisees. As the IKEA business was expanding in the early 1980s, IKEA founder, Ingvar Kamprad, realised that he needed to protect the IKEA Concept. After a long search, Ingvar decided that a franchise system would be the best choice for IKEA. It would allow for international expansion while protecting the underlying concept and stimulating an entrepreneurial spirit. Inter IKEA Systems B.V. is the IKEA franchisor who continuously develops the IKEA Concept and ensures its implementation in all markets. IKEA franchisees run the day-to-day retail business and pay a franchise fee. Together, the companies in the franchise system develop and improve how people discover and interact with IKEA and IKEA products. Inter IKEA Systems B.V. has assigned other IKEA companies to develop the range, supply and communication. IKEA of Sweden AB develops the IKEA home furnishing product range, IKEA Food Services AB develops the IKEA Food & Beverages product range, IKEA Supply AG manages purchasing and distribution and IKEA Communications AB produces IKEA communication. The diagram below shows a simplified overview of the IKEA franchise system. Inter IKEA Systems B.V., IKEA of Sweden AB, IKEA Food Services AB, IKEA Supply AG and IKEA Communications AB are companies within the Inter IKEA Group. Inter IKEA Group also includes other companies like IKEA Industry AB. The IKEA franchise system is people-oriented and encourages everyone to contribute. It forms an interdependent framework and lays a solid foundation for the IKEA Brand while enabling a scalable and dynamic value chain. Last, but not least, it answers Ingvar Kamprad’s three desired intentions: allowing and encouraging IKEA to remain entrepreneurial; enabling international growth; and keeping the IKEA Concept strong and consistent.